A warm welcome to those who haven’t read my blog before and an apology to those who normally do read my blogs. This year, I have been working on social media for several other clients which has meant my writing unless it’s for someone else has taken a back seat. I decided to put my name forward to mentor with VIC ICT for Women after being encouraged to join by one of my connections whom I met last year. Since they had a shortage of mentors, I looked after two girls this year both in IT. Lessons from this: I have a long way to go in ‘coaching’ techniques but it made me realise that this part of ‘pastoural care’ which I used to really enjoy as a Homeroom teacher was transferable to the mentoring. The great thing about it was then getting to network with both the mentees and the mentors at each gathering that was organised. Thanks to the amazing Gail, Susan and Kirsten we had a monthly Skype mastermind group that kept me on track. One of the hardest things that nobody tells you about is the solitude of working at home and this was great to just to talk out the ideas but being kept accountable as well. Lessons from this: A mastermind group is essential for any sole trader/practitioner in small business and having someone that isn’t your husband/best friend means that they can listen and offer advice. Have you ever started a project (such as craft or DIY around the house) and just not got around to it. My Digital Bootcamp I was determined to get off the ground this year and it didn’t as conference season took over my life and then I decided to start afresh next year. Lessons from this: I have learnt to set smaller targets and achieve those and then work up to the larger goals. Also looking back on reflection, Dom and I (my business manager and editor and husband) set up a client review once a week when possible to review current clients, leads and what I needed to work on for the week ahead. About three months ago, there was a callout from Vic ICT for Women to apply for a ThinkTank. I didn’t manage to get to the #BoldMoves Dinner but wanted to be a part of this ‘think tank’. Even on our first get together I got to work with some amazing people and since then have connected with many others who are just as passionate about getting women in IT and even the topic of ‘Digital Literacy’. So, some of you may have heard I am returning to the music classroom at a private Lutheran College in the western suburbs of Melbourne. This is only a part time position in teaching classroom music from Years 6- 10. I love working with teachers and this will be a good opportunity for me to put things into practice that I have been working on over the past couple of years as a ‘Digital Coach’. Lessons from this: This journey returning as a teacher (after a 8 year break from the classroom) means that I have fresh eyes looking into the classroom. I am also looking forward to being back in a community (something I have definitely missed since finishing work at the State Li2brary). 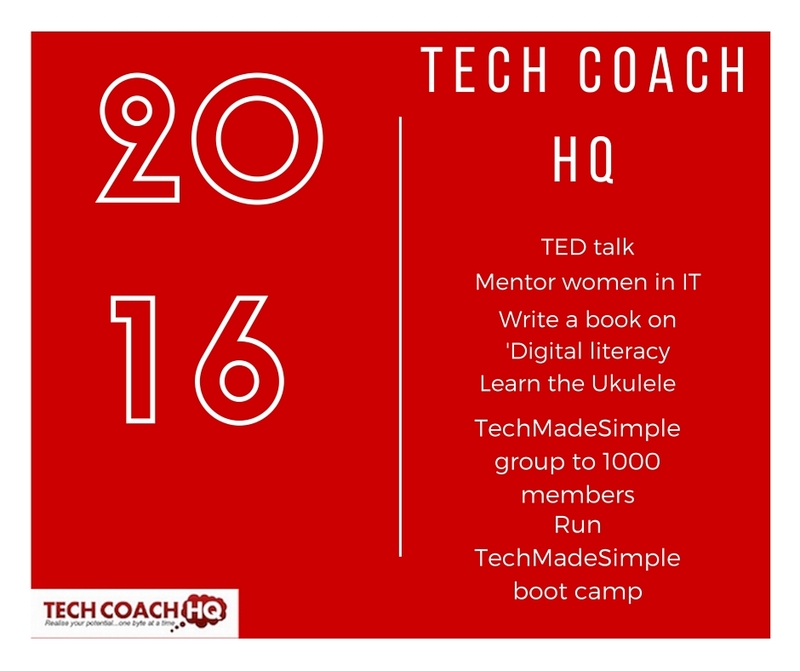 So, next year will have many new exciting adventures for Tech Coach HQ including running a ‘TechMadeSimple’ Bootcamp in Q1 in 2016. Stay tuned for our blog posts in 2015. 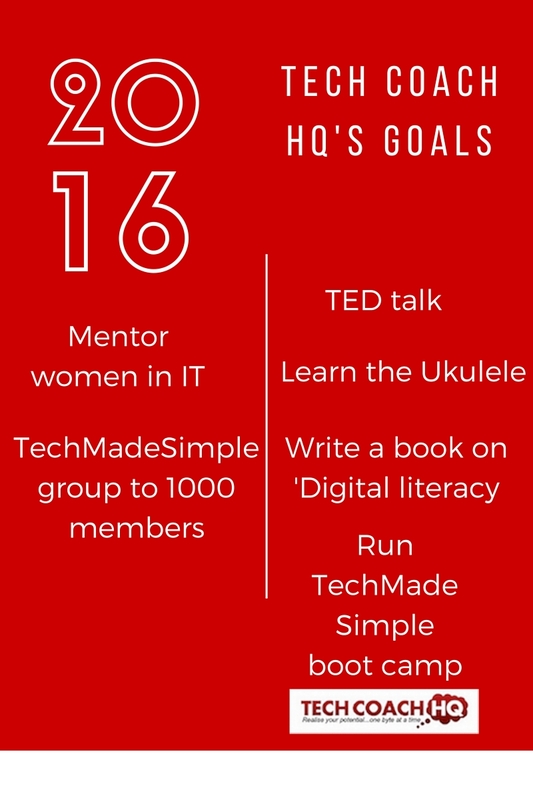 Come and join our TechMadeSimple community at https://www.facebook.com/groups/techmadesimple/ if you are a small business owner or entrepreneur. Great summary of your year…I have appreciated your never ending digital expertise and your generous willingness to share that expertise….like you I have not achieved all my goals, but you have given me so much advice and assistance. I agree a mastermind group is a great way to stay on track or at least closer to the track. Don’t underestimate your contribution to your part time teaching job,it is “more than just a job”. Looking forward to getting back into a regular basis in 2016.